Two men have been jailed for life over a plot to murder an accountant. Bernard Pillay 41, from Uxbridge, was convicted of conspiracy to murder Atif Ali, who was shot in the leg in Luton, and will serve a minimum of 17 years. Shahzad Mahroof, 28, of Luton, was also found guilty of conspiracy to murder and was told he would serve at least 15 years by the Luton Crown Court judge. Matthew McCafferty, from Flitwick, was convicted of having a gun with intent and will be sentenced next month. Mahboob Baig, 31, and Sajed Hussain, 31, both from Luton, and Mark O'Neill, 41, of Hayes in Middlesex, were all cleared of conspiracy to murder. The court heard 27-year-old Mr Ali was caught in a love triangle. It was claimed Mahroof wanted to pursue a relationship with a young woman who was engaged to Mr Ali. 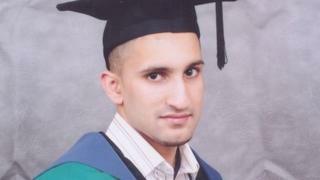 He conspired with others to murder the young accountant who was shot at close range in his left thigh in Leicester Road, Luton, at 11:30 BST on 20 May last year. He needed a seven-hour operation at Addenbrooke's Hospital in Cambridge to save his leg. The prosecution at Luton Crown Court said Mr Ali was driving a silver Audi that was hit by another car, forcing him to get out into the road. When he did so, he was shot in what was alleged to have been an attempt to murder him. Pillay, the gunman, used a weapon supplied by 23-year-old McCafferty, the court heard. McCafferty will be sentenced on 1 September. Judge Michael Kay QC said there was clearly a plan to cause grievous bodily harm to Mr Ali. He said the shooting was a "brutal and callous act" and told Mahroof: "You instigated a plan out of hatred and spite. "You are capable of the most extreme criminal acts if you do not get your own way." He told Pillay he had given evidence playing the part of a "cardboard cut out East End thug" but what he did was a barbaric, heartless and immoral act.